The Taoiseach, Ministers for Health, Transport and Climate Action have been invited to an event in Buswells Hotel on Wednesday 17th April at 4:15 pm at which Professor O’Shea will make a public presentation of the open letter addressed to An Taoiseach, Mr Varadkar. Public representatives, the media, and anyone who supports greater investment in active travel, to promote health and support climate action, are invited to attend. The Committee acknowledges the impact of car travel on congestion and that the ‘do nothing” scenario will only lead to increasing gridlock in our towns and cities. While it is accepted that the Committee has not considered school travel in depth, it is regrettable that efforts to deter school trips by car such as the closing of streets near schools to private car traffic have not been referenced. While electric vehicles have a role in decarbonising the transport sector, we regret that there is no mention of the huge potential of E-bikes. In countries where the level of cycling is high, the sale of such bikes far outweighs the number of electric cars and at far less cost to the individual and to government. It is hoped that in the future the Committee will also have the opportunity to consider the increasing use of cargo bikes for last mile deliveries across Europe, so we can replicate it here in Ireland. In summary, the report is an important step on the path to a carbon free future and Cyclist.ie warmly welcomes its publication. Its ultimate success however will depend on how it informs the adoption of appropriate targets and on the monitoring and reporting of progress in Minister Richard Bruton’s eagerly awaited All-of-Government Plan on Climate. In response to parliamentary questions, Minister Shane Ross is very keen to point out that in addition to funding from the Department of Transport, Tourism and Sport (DTTaS), the government also funds cycling through other departments including the Department of Community and Rural Regeneration and the Department of Housing, Planning and Local Government. We decided to investigate the contribution to cycling by these departments. Michael Ring is Minister for the Department of Community and Rural Affairs. In May 2018, he announced the allocation of €4.5 million. This was followed in September by an additional allocation of €8 million. These rounds of funding were under the Community Enhancement Programme (CEP) which supports disadvantaged communities throughout the country by providing capital grants to community groups so none of this funding was for cycling or cycle related projects. In January 2019, the Minister and Fáilte Ireland jointly announced funding of €10.8 million for 78 outdoor recreation infrastructure projects. Of the 78, 19 were identified as wholly or partially cycle related at an estimated cost of €1,680,786. In February 2019, the Minister made a major announcement with an allocation of €62 million for Rural Regeneration and Development projects across the country at a cost per project ranging from €20,000 for to €10.2 Million. These included three cycle related projects. The first was the development of a cycle network in Mayo/Galway at a cost of €75,000. The second was for a navigation/greenway project in County Meath at a cost of €845,250. While the cycling component of this scheme is open to debate, it is assumed for the purposes of this article that 25% or €211,312 is for cycling. The third was a flagship project of national importance – the development of mountain biking trails at a cost of €10.2 million. Mountain biking is a sport which is growing in popularity but it is a niche activity. Even among current cyclists it is very much a minority sport and has little, if anything, to do with utility or everyday cycling. Although funding was provided by the Department of Community, it could equally have been provided by that section of government dealing with sport or tourism or even transport. Omitting the mountain biking scheme, the total component allocated for everyday cycling from the other two amounts to €286,312 so in total, Minister Ring allocated approximately €2 million to cycling out of €86 million. In November 2018, as part of Project Ireland 2040, Taoiseach Leo Varadkar and Eoghan Murphy, Minister for Housing, Planning and Local Government, announced an allocation of €100 million for 88 projects under the Urban Regeneration and Development Fund (URDF). The schemes were classified under various headings including community development, culture, specific capital projects, energy development, integrated urban development, library development, public realm regeneration, road/strategic infrastructure and strategic acquisitions. The total value of the five is estimated at €5.7 million but the cycling component is likely to be of the order of €1-2 million at most out of an allocation of €100 million. We warmly welcome this additional contribution of approximately €3.5 million to everyday cycling by Ministers Ring and Murphy. However, this is a long way from Cyclist.ie’s campaign for 10% of the DTTaS Land Transport capital budget or €149 Million based on the 2019 Department of Finance allocation. As everyday cycling is essentially about transport, the heavy lifting for funding cycling rightly belongs in the Department of Transport, Tourism and Sport. If that department fails to provide adequate funding, the primary responsibility rests with Shane Ross, the Minister in Charge. Maynooth Cycling Campaign was represented at the March Meeting of the Community Council at which there was a discussion of the footpath works at the Celbridge Road. The question of cycling facilities on the Celbridge Road to the two schools was raised. Apparently, Kildare County Council has prepared a daft drawing showing proposed cycle facilities. (Cllr Tim Durkan informed me afterwards that he would forward a copy.) It seems somewhat dysfunctional that KCC has plans for cycling facilities but are proceeding with construction of a new footpath without any discussion/conclusion of what cycling facilities are appropriate. The councillor stressed the need to consult with adjacent residents but a council member stated that cycle facilities were being opposed by one of the resident groups. There was also debate and conflicting views about the ownership of green areas and the entitlement or not of KCC to go in and carry out the works. This entitlement was related to the definition of green areas/amenity areas which were defined when the estate in question received planning permission. Our view is that the rights of different groups must be balanced and that it is not simply a matter for the adjacent resident groups who generally drive, who often oppose improved facilities for cycling and favour the status quo. The needs of the wider population, objectives of the County Development Plan and government policy must also be taken into consideration. Delft was the third city in The Netherlands to experiment with modern cycling infrastructure, aided by the national government. 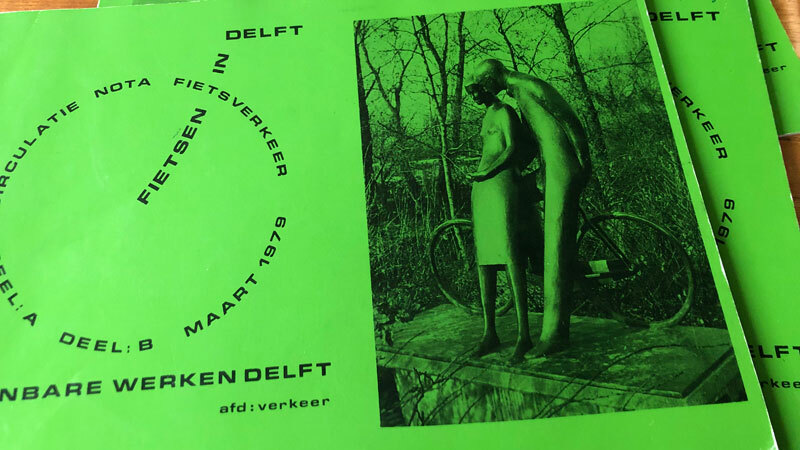 After the experiments in Tilburg and The Hague in the 1970s, where they built one very good (but also very expensive) cycle route, that had mixed results but didn’t lead to more cycling overall, Delft took a different and innovative approach. Delft wanted to improve the city’s existing cycle network, which had a lot of missing links. The reason for this area-wide experiment was the increasing modal share of private motor traffic. The city clogged up and couldn’t cope with all those cars, it certainly wouldn’t be able to accommodate even more cars in the future. Cycle expert André Pettinga, who worked for the city of Delft at the time, summarises the need for the Delft Cycle Plan in just a few words: “The local government wished to increase the modal share of cycling!”. This cycle plan was a direct answer to the mainly car-driven Traffic Circulation Plans that had been made for many cities in the Netherlands, including Delft, in the 1960s. The execution of those plans was stopped oneafter the other, because of opposition of the public and changed ideas regarding urban planning………………. Last year, TII published the National Roads Network Indicators 2017 which is their annual report on the state of Irish national roads. This includes national primary roads, national secondary roads and motorways although the report also includes some data on regional and local roads. Economic – looks at overall travel demand. One of the interesting facts thrown up in the report is that 88% of roads deliver the highest level of Service A ie free flow conditions with 96-97% of roads delivering Level of Service C which is minimum stable flow. The comparison with the Level of Service for cycle facilities is striking. Most cycle facilities offer the lowest level of service ie D. These include most of the greenways developed even those which have been hyped and spun as world class. They also include many schemes in urban areas where the allocation of space is the minimum for cycling but above minimum for motorised traffic. Local authorities consider such schemes to be in accordance with DMURS despite the hierarchy of road users prioritising cyclists above car drivers. As in 2016, 39% of trips were estimated to be less than 15 minutes in duration and 38% of trips were less than 10km in length. There was also no change in the average trip distance at 19.4km and average trip duration at 22 minutes. Once more it shows the potential to substitute trips by bicycle if the government was to properly #Allocate4Cycling by providing adequate funding and specifying high standards. The annual growth rate in traffic on the network was 3.0% nationally in 2017 compared to 4.6% in 2016. In the mid-east which includes Kildare and the other commuter counties surrounding Dublin the growth rate was 4.4% in 2017 and 5.2% in 2016. If maintained at this rate, the growth in traffic on national roads between 2016 and 2025 will be almost 50%. In the section of safety, TII pulled two sleights of hand in their presentation of road fatality statistics. The 2017 Report gives a reduction of 28% between 2013 and 2017 (64 to 46 fatal collisions) but this disguises the fact that there had been a significant increase (72) in the number of fatal collisions in 2016 which the report ignores. The percentage difference between 2013 and 2017 is only of the order of 8% which is very different from the 28% reported. The second sleight of hand is in relation to the different reporting periods. The 2016 report considered six years (2011-2016) whereas the 2017 report considered five (2013-2017). If they had used a period of 5 years in 2016 as in 2017, the change in fatalities would be from 48 (2012) to 72 (2016) – an increase of 50% which would take the gloss off the TII performance. The 2016 report states that a key benefit of a quality road system is improved accessibility to jobs which is generally seen as positive. The Impact of Road Investment on Job Accessibility between 2013 and 2017 shows this in graphical form. In practice however, this is seen in induced demand – longer commutes, more congestion in the urban areas and more noise and air pollution for those living in city centres and urban areas which are negative consequences. Trends in overall employment in the economy drive commuting traffic whilst personal incomes are the major determinant of non-commuting traffic. With regard to the carriage of goods, economic output is the major determinant. These statements are half right but simplistic. The underlying assumption is that the growth in commuting (motorised) traffic on national roads will be by private car. In the absence of any change in funding by the Department of Transport from roads to active travel, it excludes the possibility that there will be major increases in the number of people using sustainable modes of transport such as walking, cycling and public transport as required by National Transport Authority’s Statement of Strategy 2018-2030 and Smarter Travel. It also ignores policies on climate change and the potential risk of paying millions of euros for failing to meet our international obligations to reduce carbon emissions. Given ….. economic trends, the prospects are for continued significant growth in National Roads traffic overall and HGV traffic in particular. As cyclist fatalities have increased with increasing traffic over the last eight years, this is hardly good news for cyclists. Since the results of the 2016 census were published, cyclist advocates and opposition politicians have often referred to the 43% increase in commuting to work by bike in order to highlight the potential of cycling. However, the same percentage has also been highlighted by Ministers Shane Ross and Brendan Griffin in order to ‘prove’ that their policies are working and that, as a result, no fundamental changes such as #Allocate4Cycling are required. There are two problems with the ‘43% increase’. First, there are a further three categories of cyclists who broadly correspond to primary school pupils, secondary school pupils and students attending third level colleges. The increases in percentages for these are considerably less ranging from 10.5% to 25.2%. While the number of cyclists commuting to work (as opposed to education) has increased, they still only make up 3.3% of overall commuters and even this figure is exaggerated due to the increase in population between 2011 and 2016. There is a similar weakness in the analysis of cyclist fatalities on a year to year basis. With a 50% increase in 2017, it was virtually certain that the number of cyclist deaths would be less in 2018. Sure enough, when the final figures came out, the RSA reported that there was a reduction in cyclist fatalities. No news there! What this overlooks is that taking a 3 year average, the low point for the number of cyclist fatalities was in 2011. Since then it has either increased or remained the same for each of the last 7 years. We are at a critical time when cycling is moving up the political spectrum. #Allocate4Cycling – significantly more funding, reallocation of road space and higher standards are essential components of this campaign. We shouldn’t undermine it by accepting the spin by government of the Census results or of focusing on fatalities on an annual basis. Instead we should reference progress towards the NCPF target and the trend of cyclist fatalities. The Department of Transport Tourism and Sport (DTTaS) and the Road Safety Authority (RSA) can rightly claim responsibility for the large decrease in road fatalities over the last thirty years. However, in claiming a reduction in road fatalities in 2018, they are blind to the trend of increasing cyclist fatalities since 2011 and by failing to properly allocate for safer cycling, the DTTaS perpetuates a road and traffic environment where cyclist safety is secondary. The DTTaS and the RSA are very concerned about the number of fatalities on Irish roads. At the end of each year, they respond to the annual number of fatalities and welcome the results if the number goes down and lament if the number goes up. Their benchmark for success or failure of road safety policy is annual number of fatalities relative to the previous year. This is a good yardstick when the numbers involved are relatively large. When the number is relatively small, as in cyclist fatalities, the total for consecutive years can vary widely. If, however, the number of fatalities is averaged over three years the effect of large swings is reduced and longer term trends are discernible. Analysis using a three year average shows that cyclist fatalities were at a low point in 2011 but have since risen significantly – more than 50%, albeit over seven years. Other countries which have significantly increased the level of cycling, have done so while simultaneously reducing the number of fatalities. Colm Ryder, Chair of Cyclist.ie, the Irish Cycling Advocacy Network, states “The increasing level of cyclist fatalities in Ireland is unacceptable. To address this as a matter of urgency, the DTTaS must begin to properly allocate for cycling”. The DTTaS currently spends less than 2% of its transport capital budget on cycling. To maximise the contribution of cycling to reducing carbon emissions and increase health and environmental outcomes, the Minister must increase expenditure to 10% of the Land Transport capital budget, and not to 10% of the Public Transport budget as recently announced. The Intergovernmental Panel on Climate Change has reported that the next twelve years are critical to prevent global warming beyond 1.5o. The clock is ticking …….. The following press release appeared in the Examiner on 21st December. The Government’s recently published Annual Transition Statement 2018 has ignored the potential for cycling to reduce transport emissions. The legislation is designed to enable Ireland’s transition to a low carbon, climate resilient and environmentally sustainable economy by 2050. However, the section of the Statement dealing with the decarbonising of the transport sector demonstrates a complete failure by Minister Ross and his Department to grasp the potential contribution that cycling can make to a reduction in carbon emissions. Transport accounts for over 52% of energy used in Ireland and is increasing. It is one of the four key areas where a reduction in carbon emissions is required to meet our international obligations. Section 4.4 of the Annual Sectoral Mitigation Statement deals with decarbonising transport and states that this involves providing meaningful alternatives to the private car, continuing investment in sustainable transport and promotion of modal shift. However, in the accompanying National Mitigation Plan Actions, a different narrative unfolds – one where rhetoric is divorced from anything remotely approaching meaningful action. The Update Report on Actions contains a section entitled “Actions not delivered as planned”. It includes words like “publish”, “review”, and “strategy” rather than “fund” and “enable”. Six of the actions were due to be completed by the Department of Transport Tourism and Sport in 2017. These include “Publish a review of the National Cycle Policy Framework” which originally commenced in 2013 and which 5 years on has still not been completed. Under Actions Complete, the Decarbonising Transport section lists five items. The DTTAS were responsible for two – setting up a behavioural change working group and publication of a Greenway Strategy. Greenway funding is welcome but it is disingenuous to claim that publication of a strategy or the setting up of a working group will reduce emissions and it is noted that no estimate of emission reduction is included. The recent IPCC report clearly spells out the urgent need to reduce carbon emissions in order to limit global warming to 1.5°C. To minimise environmental damage and fines arising from the failure to meet Ireland’s climate change targets, Minister Ross must adopt much more ambitious actions than currently outlined. Cycling is the mode of transport for more than 40% of people in many progressive European cities. Cycling will not solve the problem of climate change on its own, but as 57% of Irish journeys are less than 8 km, it can make a significant contribution as well as alleviating congestion, contributing to cleaner air, improving health outcomes and creating attractive neighbourhoods, For cycling to play its part however, Minister Ross must begin to properly fund high quality cycling infrastructure which will enable cycling for all. “Cycling offers the best and quickest return on investment of all transport expenditure. We urgently need to invest a minimum of 10% of transport funding in cycling infrastructure, to give people a safe, attractive alternative to the car” says Gerry Dornan, Vice Chairperson of Cyclist.ie, the Irish Cycling Advocacy Network. Nearly two thousand years ago, the Emperor Nero is reputed to have fiddled while Rome burnt. In the next few years we shall see if our current leaders will emulate him or take decisive action to stop climate change.